The word “nightmare” is derived from the old English term “mare” which is the name of a mythological demon that torments others with frightening dreams. The prefix “night-” was added to stress the dream aspect. The word “nightmare” cognates with the older German term “Nachtmahr”. The word “nightmare” is currently used for all kinds of dreams that broach negative experiences. Persecution dreams, fear dreams etc. In our society all kinds of nightmares are being rated as psychic dreams and so it is tried to cure them with psychic methods. 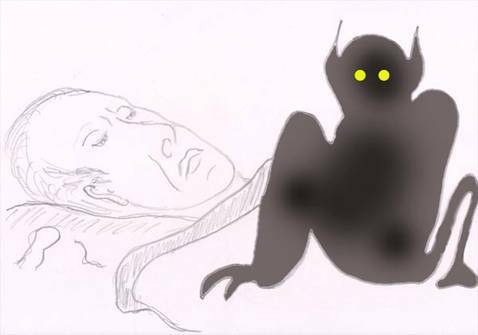 The incapability of motion of the body caused by the sleep paralysis causes anxiety. Additionally, the breathing flattens (often in supine position) and the blood becomes deoxygenated. There is a brain center that hits the alarm under these conditions causing panic. In the present sleep-awake-state, dreamlike perceptions occur in which the subconscious generates the illusion of being attacked by other beings. In the state of having nightmares we have a normal body awareness (although paralyzed) and the ability to think in normal ways or we just have a slightly limited logical thinking. At the same time we still (or already) are in a state that is close to dreaming. The subconscious tries to explain this state. This “explanation” can be the strong feeling of an other being nearby. This happens if we are far enough from dreaming so that no pictures appear. Sometimes this “explanation” is the perception of a person. Due to the overlay of the feeling of being awake and the sleep paralysis with dream illusions, the experienced contents are being assigned to the wakefulness. That is why many people think they are being attacked by ghosts. This idea is being supported by the fact that we feel that we are lying in bed and perceive the “familiar and normal” room around us. “Once the experience was different. Everything began like it always begins. At first my body got heavy, I heard a beep and I became incapable of moving. Suddenly, a dark human shape appeared to my left. I cannot tell whether it was a man or a woman. It looked like the person wore a black hooded coat and a hat. It grabbed me by the head and pushed it really hard. I was horribly scared. I concentrated on telling myself again and again: “You have to get up!”. Once I managed to jump out of my bed and turned on the lights. Everything was gone! “I think I suffer from sleep paralysis! I am nearly 23 years old now and I experienced that for about eight years now, maybe even longer. It was not until yesterday that I discovered that other people are also suffering from this condition. I didn't speak with anyone about it for a long time until I was really exhausted and just had to tell it to my mother. At first, she seemed not to take it as serious as I did. After a few nights I woke her up crying, she toke the condition more seriously. We always thought it must have something to do with my circulation because right before I fall asleep I hear a humming sound. This sound was unbearable. It was so agonizing that I was scared to fall asleep for a long time. I thought maybe I should sleep without a pillow so that the blood in my head could circulate better. For a little while the dreams stopped but came back soon after. I was completely at a loss. The dreams come and go! My mother called me yesterday and told me that she heard someone talking about his dreams in a radio show with the topic “extraordinary happenings”. His dreams where similar to mine. After that I searched the internet and found this homepage. I will describe these strange dreams: I lie in bed and start falling asleep. When I reach the state of doze, I hear unbearable humming and murmur.